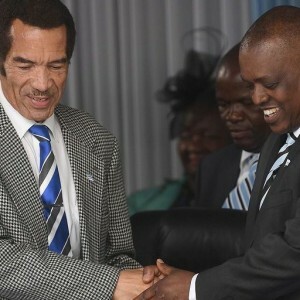 On 1 April, Botswana’s former president Ian Khama handed over the reins to Mokgweetsi Masisi, 56, a former education minister, after completing his constitutional two terms in office. Khama’s retirement was a rare phenomenon on a continent used to heads of state clinging to power. Botswana has been an example of orderly succession since independence. After the death of the country’s first president, Khama’s father Sir Seretse Khama in 1980, all Botswana’s heads of state have stepped down peacefully. The country arguably had a good start. Khama senior was the leader of the Bamangwato tribe, and exchanged his royal robes for the suit and tie of a politician, leading the country to independence in 1966. He was followed by Sir Ketumile Masire and then Festus Mogae, a beneficiary of the Mo Ibrahim Prize for good governance. Mogae continues to serve Africa, notably as head of the African Union (AU) joint monitoring and evaluation mission for South Sudan. In many parts of the continent, leaders are changing constitutions in order to stay on longer than their mandated terms. In southern Africa, it took a military intervention in November last year to get rid of Khama’s nemesis, former Zimbabwean president Robert Mugabe. Yet Botswana’s political system is not perfect. While the system, built on the heritage of pre-colonial Tswana culture, has led to organised succession in modern times, some believe this limits competitive politics. The legacy of the hereditary system has infused parties such as the ruling Botswana Democratic Party (BDP) with a dearth of political competition, says Botswana academic Zibani Maundeni in his book 40 Years of Democracy in Botswana. He warns that succession in Botswana – especially the automatic succession from vice-president to president – is highly elitist and could limit opening up the political space. Meanwhile, Khama’s 10 years at the helm haven’t been devoid of controversy. Lieutenant-General Dr Seretse Khama Ian Khama, as he is referred to in state-owned media, was criticised for his authoritarian leadership style in the country and in the BDP. The ruling party has been in power since independence and is expected to win elections again in October 2019, albeit possibly with a reduced majority. After coming to power in 2008, Khama also sent shockwaves through the media fraternity with the passing of a Media Practitioners Act that was seen as an attempt to restrict freedom of speech. Several journalists claim to have been threatened and intimidated by the Khama regime. During the latter part of his term, there were suspicions that Khama was trying to push for his younger brother Tshekedi, the tourism minister, to succeed him as president. Following a backlash from BDP parliamentarians, however, Masisi became deputy president in 2014, putting him in line for the top job. Economically, all is not as rosy as it seems in Botswana. Although the economy continues to grow by up to 5% annually – one of the best growth rates in southern Africa – Khama is criticised for not focusing enough on diversifying the economy away from its dependence on diamonds. A World Bank report says Botswana is still vulnerable to external shocks due to this dependence. As in many other countries in the region, inequality is high and the rate of youth unemployment is around 50%. Botswana also remains dependent on revenue sharing through the Southern African Customs Union for about 25% of its budget. South Africa, its main trading partner, dominates the retail and tourism market. In fact Botswana is currently the biggest importer of South African goods and services in the Southern African Development Community (SADC). Still, Botswana has for years reached the top 10 of major governance rankings for the continent. The country was ranked the least corrupt of all African countries in the Transparency International 2017 Corruption Perceptions Index, and was placed 34 out of 180 countries. Botswana also ranks in the top 10 of all the Mo Ibrahim governance indicators covering safety and rule of law, human rights and participation, economic opportunities and human development. Internationally, Khama has followed in his predecessors’ footsteps by continuing Botswana’s steadfast opposition to power grabs in Africa and the region. Khama stood firm in his opposition to Mugabe, who almost single-handedly wrecked Zimbabwe’s economy. He also criticised the Democratic Republic of Congo’s President Joseph Kabila, who has postponed elections for two years beyond his December 2016 constitutional deadline to step down. Khama has continued supporting the International Criminal Court (ICC), despite strong criticism against the ICC in Africa. Botswana’s support for the ICC in a region where the court was particularly unpopular could have cost it votes during its bid to lead the AU Commission in July 2016. Botswana’s foreign minister Pelonomi Venson-Moitoi failed to achieve a two-thirds majority of votes during the election and voting was postponed to January 2017. Khama regularly shunned the bi-annual AU summits, as well as the annual United Nations General Assembly debates, leaving it to his vice-president to attend. Insiders say Masisi has vowed to continue to attend these summits now that he is president and ‘restore the legacy of Khama’s father’ who was often present at international gatherings. Botswana has clearly benefited from a series of relatively good leaders, as well as abundant natural resources, since independence. The challenge going forward is to continue with a focus on economic diversification, moving away from the country’s dependence on diamonds. Closing the wealth gap in one of the world’s most unequal societies will also be a huge challenge for the new president. Botswana is host of the SADC secretariat, headquartered in the capital Gaborone, and thus has a vital role to play in the region. It can use this opportunity and benefit from current efforts to boost SADC’s capacity. Masisi should, among other issues, make sure Botswana benefits from the SADC regional industrialisation plan and the focus on regional value chains in SADC, destined to promote manufacturing across the region. Khama says he is looking forward to retirement and is apparently planning to extend his farming endeavours thanks to the livestock he received as a parting gift from local communities. Masisi has big shoes to fill.